Protect your teen on the road this summer. School is out. 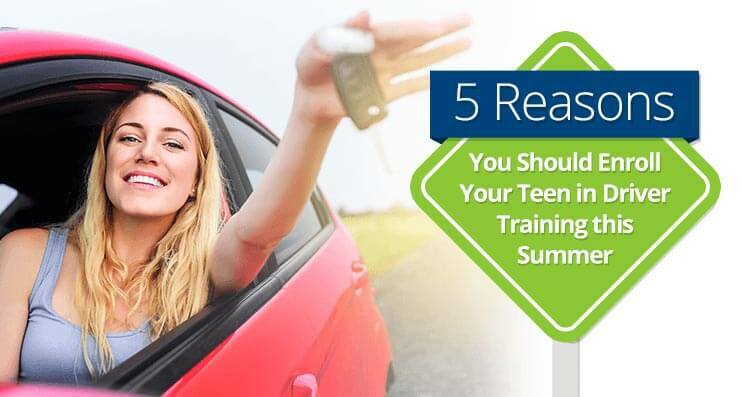 Summer is in, and your teen needs driving training courses more than ever before. Unfortunately, there is something about this season that makes it one of the most dangerous times to be on the road. While a lot of strides have been made in driver safety over the years, motor vehicle crashes still remain the number 1 cause of death for drivers between the ages of 15 and 19. In fact, teens have the highest crash rate of any age demographic in the U.S.
And since more teens are out on the road during the summer months than in any other season, it’s critical to ensure that they have the education and experience to stay safe out on the roads. And that means getting them behind the wheel next to an experienced driver in a structured education program. Need more convincing? Here are 5 important reasons to enroll your teen in driver’s education this summer. Here are 5 important reasons to enroll your teen in driver’s education this summer. The Span of time between Memorial Day and Labor Day is considered the 100 Deadliest Days of Driving because this is when teen crash fatalities start to go way up. Summer is a time for recreational driving. Teens are driving for fun, not just to get from point A to point B. Teens tend to drive with other teens in the car more often, which increases the risk of crashes. Clear conditions (and other teens in the car) may tempt teens to speed. Longer days means teens stay out longer, and night driving leads to higher risks. These and many other factors add to the importance of making sure your teens are educated and experienced before they join the summer rush. According to an analysis of the government’s Fatality Analysis Reporting System (FARS), in 2013, an average of 220 teen drivers and passengers died in traffic crashes in every summer month. Some teens just put off getting a license for a variety of reasons. Some may not have a car. Others may not think they can afford gas prices. And, unfortunately, some don’t want to take a driver’s education course. This means that, once they turn 18, they can get a license without getting the same education and experience as those who completed their coursework. What this means in real terms is that more and more people are getting on the road without any formal training. In fact, the only real example they have at that point is what they’ve seen friends and family do (and all of the bad habits they’ve picked up over the years). Driver’s education courses provide experience under less risky conditions and a safety-focused education. How much does this really help? Research shows that states with a comprehensive driver licensing program have a 38% decrease in fatal crashes and a 40% decrease in injurious crashes that involve 16 year-olds. It’s bad enough when adults get distracted while driving, but since teens have less experience behind the wheel and dealing with multiple things happening at once, the situation becomes even worse. The AAA Foundation for Traffic Safety did some research and was able to create a list of the most common distractions that led a teenage driver to crash. Safety-focused education can teach teens about the dangers of distracted driving and make sure they understand how real this problem is.There was a time when studies claimed that driver’s training programs didn’t actually reduce crashes (leading to many states cutting the programs from their schools), but more modern research has shown just the opposite. This study, performed by researchers at the University of Nebraska-Lincoln followed 150, 000 teen drivers for 8 years. What the found was that drivers who had not completed driver’s education were 75% more likely to get a ticket and 24% more likely to be involved in a fatal or injury accident. Swerve Driving Schools is also a Washington State testing center that offers Knowledge Testing and Road Testing.